The liver, it's the largest organ in our body, and perhaps the most neglected! It has so many important functions like cleansing the blood, supporting digestion, and storing important vitamins and minerals like B12, Iron and Copper. 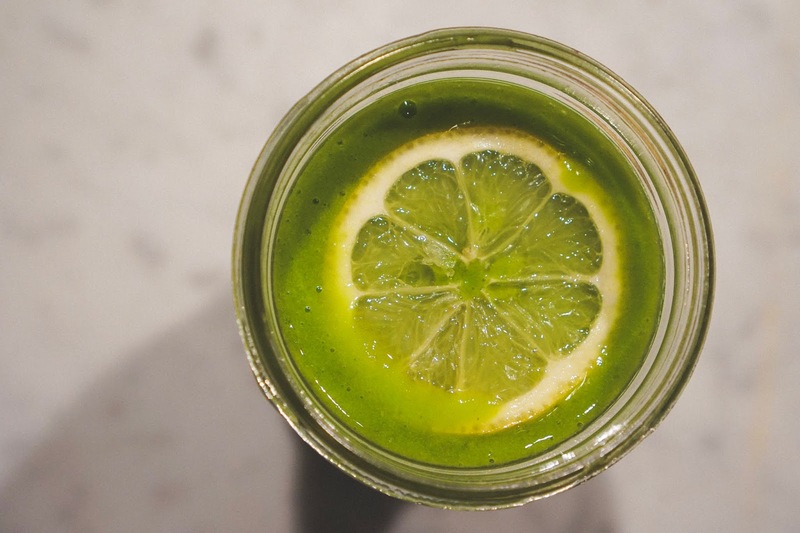 This super easy smoothie recipe is a great way to support your liver! Lemon, and ginger have a detoxifying effect on the body, which helps take some stress away from the liver. Spinach has high levels of bioavailable iron, and mango, high levels of copper. Blend everything together to make a super refreshing drink, that gives your liver the love it needs! The Hostess with the Mostess, Klaudia of The Travel Critic. 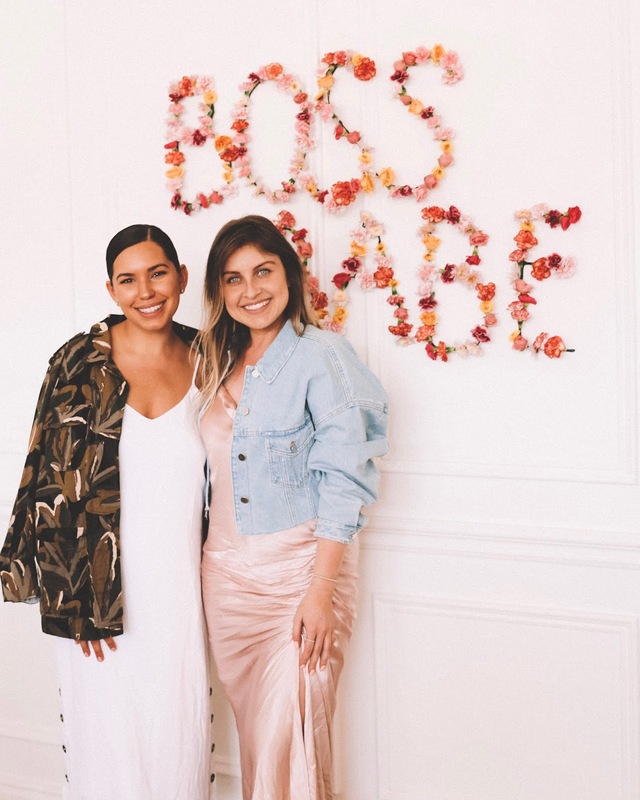 This past weekend I had the pleasure of participating the Boss Babes Brunch + Panel, hosted by Klaudia Patrycja of The Travel Critic! It was an amazing afternoon of yummy food, networking, and hearing inspiring insights of the panel of Detroit Boss Babes! The gorgeous event space was provided by Christina of Tribe Detroit. The panelists were a group of four, unique, diverse, but all equally driven and successful Detroit women. Moderated by Alyonka Larionov, the panel consisted of Valentina Juncaj founder of Vajze jewelry, Meagan Ward founder of Femology Detroit, Terra Castro founder of Detroit Body Garage and Kelli Coleman co-founder of Ten Nail Bar. Each woman gave their personal perspective on being a female entrepreneur, work/life balance, relationships and more. It was both inspiring and refreshing to hear such a real, honest conversation happen between four successful, aspiration women! The view at Bonobo Winery. This past weekend some girlfriends and I headed north for a weekend getaway at my family's cabin outside of Traverse City. 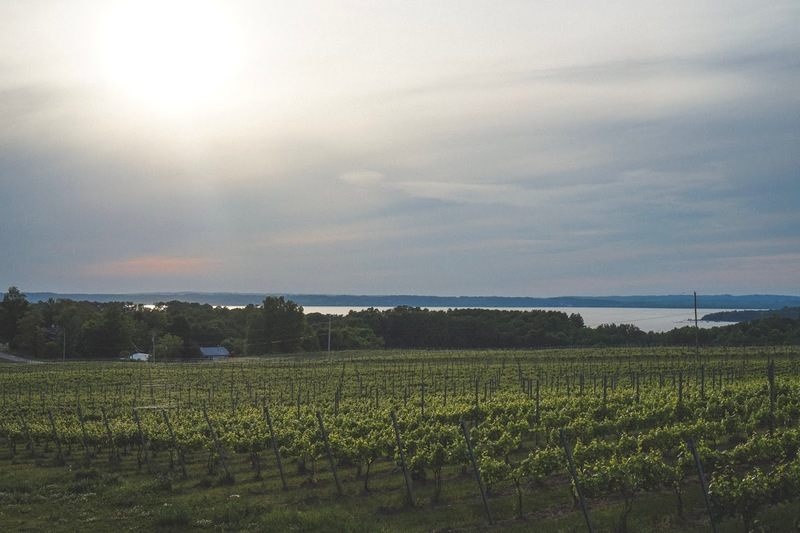 Usually I only visit during the winter months for skiing and snowmobiling, but there is so much to do in Northern Michigan in the summer, we decided to plan a weekend trip! Of course, during any trip, I always plan ahead and look for places that are vegan friendly. I was pleasantly surprised to find that there are plenty of plant based options in the TC area, that made spending time out and about during the weekend quite easy. Some of you were also generous enough to offer suggestions of places, some of which we were able to check out, others will go on the agenda for next time! 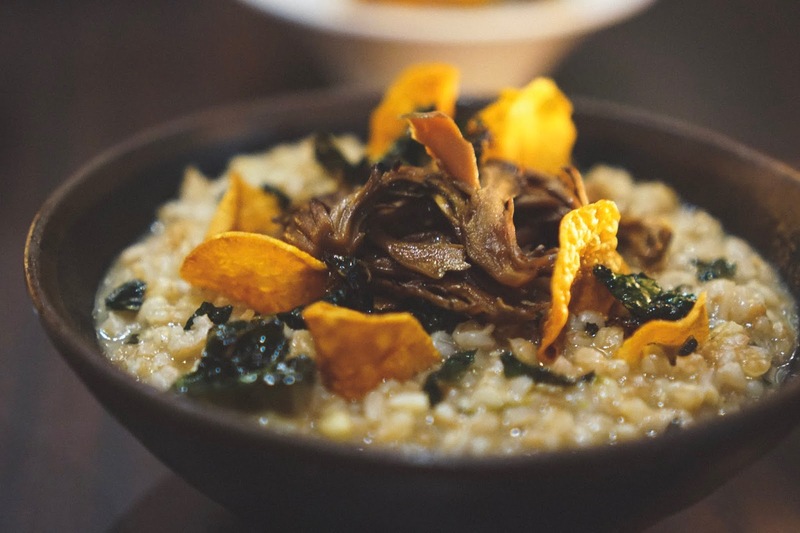 I've shared in detail the places we were able to check out, but will also list everything I found with vegan options below in hopes that you'll have lots of options for you next visit to the Traverse area! The unbelievable risotto at The Apparatus Room. What Detroiter wasn't excited when they heard about the opening of the Detroit Foundation Hotel? When I worked at the RenCen I used to drive past the old fire station every day and pray to the historical restoration gods that someone would save that beauty of a building. When DFH was announced I couldn't have been more excited that not only would the building be salvaged, but something COOL was going in! Since the launch, I've had the opportunity to stay at the hotel and it was an all around fabulous experience. Gorgeous design, great service, and hello, Le Labo bath products! With their restaurant The Apparatus Room however, I didn't have such luck. Unfortunately their menu is extremely meat forward, and as with many other local vegans I've heard from, I never had a great experience trying to eat plant based there. Such a bummer because it's such an amazing space, with a fun vibe, but alas I had kind of given up. Luckily I had the fortune of meeting Detroit Foundation Hotel GM, Bob Lambert, through a friend/happenstance. Being that I am a local Detroiter that had been to the hotel a fair amount of times, Bob was interested to hear about my personal experience with the hotel. I explained to him (nearly verbatim) what I wrote above about previous visits - hotel is fab, but I always leave hungry. Bob generously offered his contact info and extended the invite to return for a visit, this time with a little heads up to the kitchen. 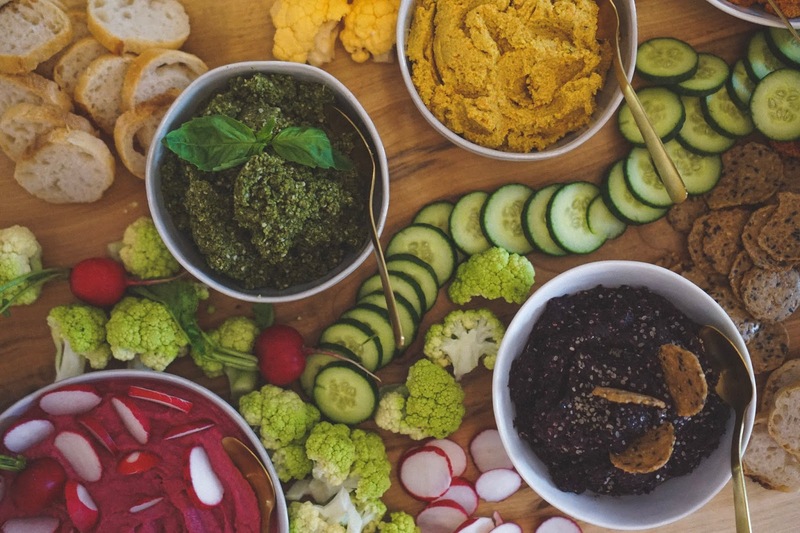 Beet Hummus, Olive and Basil Tapenade, Sunflower Basil Pesto and Spicy Carrot Dip. This weekend we celebrated the launch of Planthropie, a completely plant based food and raw dessert company, started by my friend Rua Oshana. The beauty of Planthropie is that not only do they make absolutely gorgeous, delicious food, but they also have a mission of giving back to the community and teaching local Detroiters about the importance of nourishing and caring for their bodies with a plant based diet. Rua hosted the launch at Femology. Created by Meagan Ward, Femology is a female driven co-working, collaboration and event space in Detroit. It's an absolutely gorgeous restored brownstone on Jefferson Ave. in the heart of downtown. It was the perfect backdrop for Planthropie's gorgeous food spread!